PUNE:Police have arrested three drunk men travelling in an SUV for allegedly making obscene gesture and abusing two women traffic constables and a male officer at Mammadevi chowk near the race course on Pune-Solapur Road. The incident occurred around 5.50pm on Wednesday when the men were asked to stop during a drive against vehicles with tinted glass. The three men, residents of Ashoknagar in Nigdi-Pradhikaran, ignored the police's signal to stop and kept driving towards Golibar Maidan. While passing by the traffic constables, the driver lowered his window screen, hurled abuses and made an obscene gesture at the women constables. The constables used their walkie-talkie sets to alert the beat marshals and traffic constables manning the square ahead. Police intercepted the SUV near Golibar Maidan. On seeing the police approaching them, the youths hurriedly broke a few beer bottles inside the SUV. The smell of alcohol was too overbearing for the police to miss, when they asked the men to get down from the SUV. 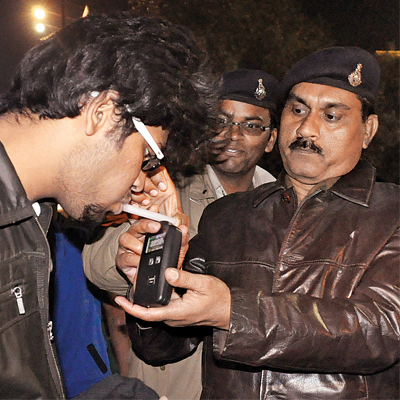 They conducted a test on the trio with a breath analyser and found them drunk. The trio then created a scene by sprawling in front of a PMPML bus in a desperate bid to avoid police action. One of the women traffic constables later filed a case with the Wanowrie police against the three —Siraj Rustam Ansari (24), Raju Gaikwad (23) and Kiran Gawali (25). All three were arrested. The three were also booked for relevant offences under the Motor Vehicle Act for drunk driving, he added.